Green Glue is a liquid, waterborne, viscoelastic damping compound representing the highest performance soundproofing product of its type. 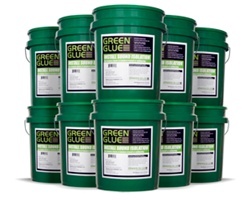 Green Glue offers superior performance in lowering the resonant frequency of walls, ceiling, or floor surfaces. Green Glue uniquely serves as a sound isolator and sound dampener resulting in a higher Sound Transmission Class (STC). A five (5) gallon pail of Green Glue contains covers a 365 square foot area at a rate equivalent to 2 tubes per 4' x 8' sheet. You will gain an additional 20% improvement by applying 3 tubes (28 oz tubes) of Green Glue per 4' x 8' sheet. You've decided to use Green Glue but you only need enough for a small area. Well, we're the only ones in the industry offering a Green Glue Eval Kit for those small projects of up to 32 square feet in area.